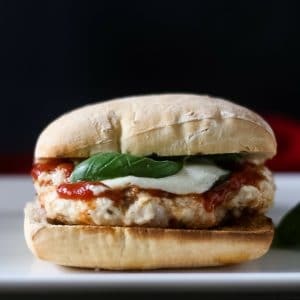 The Best Chicken Parm Burger recipe takes the fabulous flavors of Chicken Parmesan and puts them into an amazing burger. These grilled chicken burgers are always a hit at our family BBQ’s! The ground chicken has fresh Parmesan cheese added as well as aromatic herbs to make a perfectly seasoned juicy burger! 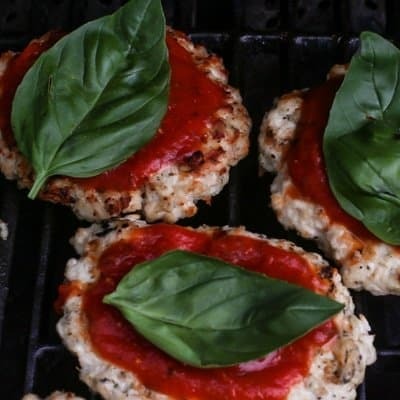 Top these Parmesan Chicken Burgers with fresh basil, marinara sauce, and fresh mozzarella! These grilled chicken burgers bring the taste to the next level! Keto-friendly – to keep keto, use a lettuce or collard wrap in lieu of a ciabatta roll. This burger has been created by me as part of an amazing #BurgerMonth event hosted by the amazing #GirlCarnivore, all opinions are my own. The fam loves chicken parmesan. I bake, not fry the chicken when I make chicken parm! When summer hits, I’m a griller! I love grilled chicken burgers because they are healthy, low-calorie, and low-fat. These chicken parm burgers are flavored with parmesan cheese, spices, and Italian seasoning and they are super juicy! Top with marinara sauce, fresh basil, and melted mozzarella! everyone will come back for the recipe! Ground chicken burgers are not difficult to work with but you need to know they need added flavor. Just like a marinated chicken breast is flavorful, adding seasoning to a chicken burger makes it much more flavorful. These Chicken Parm burgers freeze really well. I recommend making a triple batch and freeze some for later. What are the origins of Chicken Parmesan? Growing up in a predominantly Italian neighborhood in New York, I have gotten to learn a lot of amazing Italian recipes. Chicken Parm is actually not Italian based. A dish from Middlesbrough, England called Parmo, fried chicken with a bechamel sauce is where it originated. I know, shocker right! What type of chicken is used to make these Chicken Parm burgers? I only use chicken breasts but you can use thighs if you prefer dark meat. However, I buy boneless chicken breast and ground the meat in the food processor. Huge financial savings because boneless breasts are so much cheaper than buying ground chicken meat. 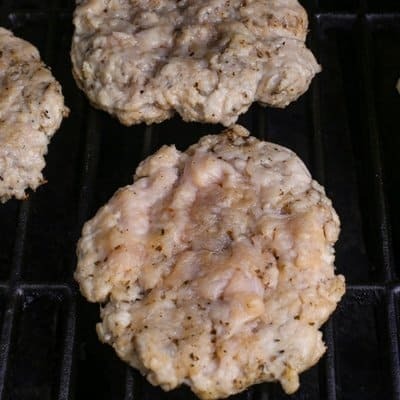 Can fresh ground chicken burgers be frozen for future use? Absolutely! I always make a triple batch or so when I am making chicken burgers. What side dishes pair well with these Chicken Parm burgers? How do you freeze ground chicken burgers? Once you have formed the chicken patties place them on a baking sheet lined with wax paper. Place the tray in the freezer for about 15-20 minutes so the chicken burgers get firm. Remove the tray from the freezer. The chicken burgers can be stacked with wax paper in between each patty and placed in a freezer-safe bag. The bag should be labeled with the date and identifying that chicken parm burgers are in the freezer bag. When ready to cook the burgers. Remove from freezer. I have cooked them from the frozen state and also after defrosting the burgers. Personally, whatever is easier for you at the time of cooking will work. The internal temperature of the parmesan chicken burger should be 170 degrees. Please save your money and buy boneless chicken breasts when they are on sale. So much more affordable than store-bought ground chicken. Using a food processor, chop the chicken into chunks and add to the processor. Pulse 4-5 times to break down the chicken. Remove the chicken to a bowl and add the seasonings and freshly shredded Parmesan cheese. Form into burgers and place the ground chicken burgers in the fridge for at least 30 minutes to firm up the burgers before grilling. Use either non-stick barbecue spray or olive oil to place on the grill grates. Pre-heat the grill to 400 degrees. Place the chicken parm burgers on the grill and reduce heat to medium, about 350 degrees. Cook the burgers for about 4 minutes, grill cover closed. Flip the burgers. Flip the ground chicken breast burgers. Add the marinara sauce and basil leaf. Top with fresh mozzarella. Grill another 4 minutes. The ciabatta roll can also be grilled at this time. 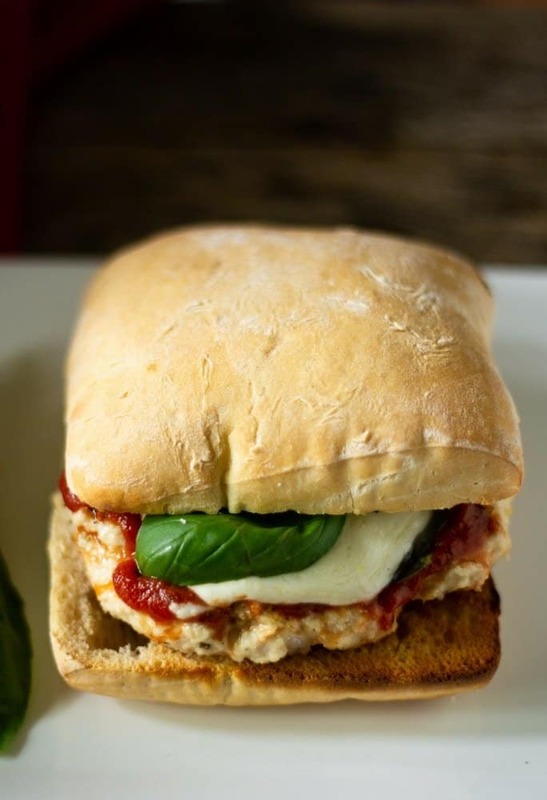 Place the chicken parm burgers on the ciabatta bread and serve immediately. Enjoy! Veal Made Easy, and Weber Grills. I love any comments or questions below! 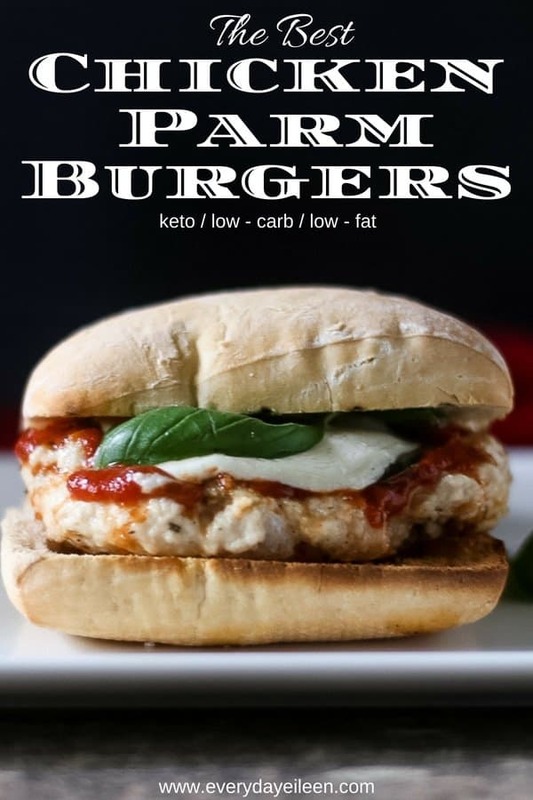 Are you loving these juice chicken parm burgers, giving it a 5-star rating and any comments are super helpful for me and very much appreciated! All the flavors of chicken parmesan in a juicy burger. 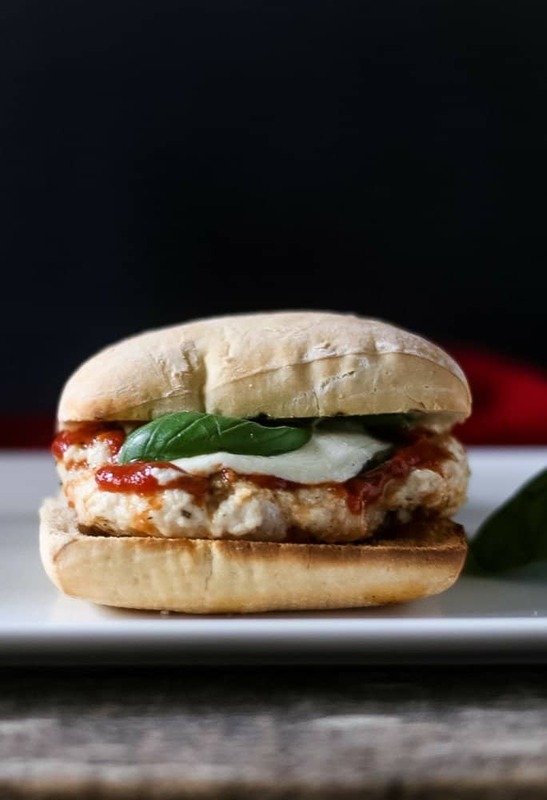 Seasoned Ground Chicken grilled and topped with your marinara sauce, fresh basil, homemade mozzarella on a grilled ciabatta bread seasoned with olive oil and garlic. Cut the chicken breasts into 2-3 inch chunks. If any visible fat, remove and discard. 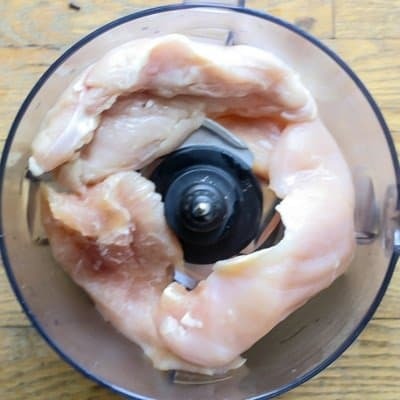 Place the chicken in the base of a food processor with grating blade. Pulse to break up and grind chicken. As seen in photo #2 above. Remove chicken from processor and place in a medium bowl. Add the parmesan cheese, Italian seasonings, black pepper, garlic powder, onion powder, ground fennel, and salt. Gently mix ingredients together. Place a piece of wax paper on a baking sheet. Using 4 ounces of chicken per patty, Form into round patties. Place the patties on the baking sheet and refrigerate for about 20 minutes. Make sure grill grates are clean. Either spray with non-stick spray or brush olive oil on grates. Preheat grill to 400 degrees. Place the chicken parm burgers on the heated grill. Reduce heat to 350 degrees medium. Close grill. Let cook about 2 minutes. If desired open grill and move chicken to form crisscross grill marks, close grill and cook for another 2 minutes. (4 minutes total). Flip burgers and place 2 Tablespoons of Marinara Sauce on each Chicken Burger. Add a basil leaf or two and top with fresh mozzarella. Close grill cover and let cook another 4 minutes. The internal temperature of the chicken should be 165 degrees. Remove from grill. Place 1/2 teaspoon of olive oil on the inside sliced dough of the rolls. Rub with the garlic clove. With 2 minutes left of cooking the chicken, place the rolls, dough side down on the second shelf of the grill. Let toast to your desired doneness. 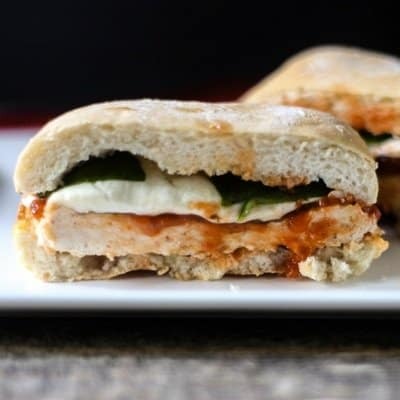 Serve the chicken parm burger on the toasted Ciabatta Roll. Enjoy! To keep this chicken parm burger keto, either without the bun or in a lettuce wrap. Note - the burger is gluten-free. The ciabatta bread I used is not, please read labels if a gluten-free roll is needed. 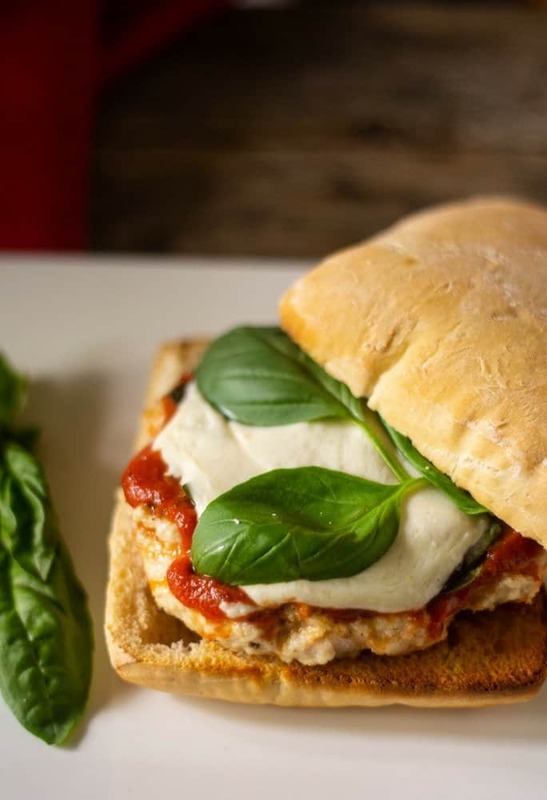 This recipe is for the chicken parm burger only, add in your calories for your roll. I find it necessary to refrigerate the chicken parm patties to make them easier to handle. These ground chicken burgers freeze really well. I place the patties on wax paper on baking sheet. Making sure the chicken patties do not touch. Place in the freezer for about 1 hour so they can solidify. I then place together, with wax paper separating each patty in a freezer bag. Dated and labeled with Chicken Parm burgers. I cook these within 3 months of freezing. These can also be pan-fried. I spray non-stick oil in the pan and the cooking process is the same, 4 minutes per side usually does the trick. Any nutritional data I provide is an approximation and actual dietary information can vary based on ingredients and proportion sizes. What a great post Emily! The chicken park burger looks amazing and I’m thibking about making it soon. I’ll probably won’t use tomatoes shut other than that, I’ll go for everything else in the list. Awesome Aish! I hope you check back in after you make this one! What a delicious idea to put chicken parm in a burgur! A must try for me. Colleen, I love chicken parm, so this is a no-brainer delicious one for me and the family. Enjoy! I’ve literally just eaten my dinner 5 mins ago and I’m drooling at this haha it looks AMAZING! That is awesome Emily! I hope you make this chicken parm burger soon and let me know how it goes for you! Enjoy! OKay, so this looks delicious! I am going to have to try this. My husband has been wanting us to try more chicken recipes. I hope your husband enjoys these chicken burgers as much as my family! I hope you make these burgers and enjoy! Those sound delicious! And I agree, chicken burgers need some help. This is a great way to give it. Basil, tomatoes, and cheese?!! I am all in! This chicken sandwich sounds so delicious and your photography is making me drool! LOVE it! Thank you, Kiki! I hope you enjoy the chicken parm burgers! This is a gorgeous burger! I love that it’s grilled chicken instead of fried. Plus, you’ve used ciabatta! That’s a bread that will hold up to just about any sandwich or burger. This is one we would definitely try! Thank you Kim! I hope your family enjoys the burgers! Omg this is so amazing and perfect for summer,I will definitely try soon.Love a good parmesan sandwich. What a fun and healthier burger. I love that you made it chicken parm style. Great recipe. Thank you Debi, I am happy you like the recipe! I am loving these ground chicken burger and the flavors are fantastic. 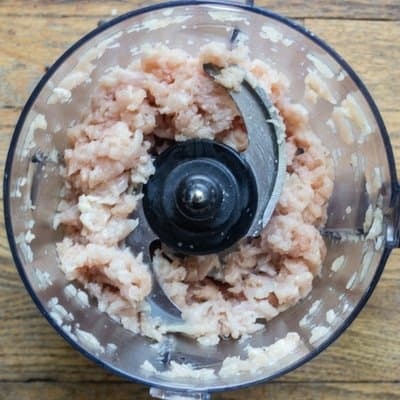 I buy boneless skinless chicken all the time and I have never dropped in in my food processor to make ground chicken. Thanks for the tip! Oh yum! Just looking at this recipe made me hungry! Love the idea to use marinara sauce there! Very clever! You’re so right about ground chicken needing added flavor! I tend to do turkey burgers more often than chicken, but this one looks fantastic! It’s such a fun way to enjoy an Italian favorite during grilling season – YUM! Exactly Ashley, I hope you enjoy these chicken parm burgers. Yum! This is such a creative idea, and so beautifully done, too. It’ll be great for a cookout! I’m happy you enjoy these chicken parm burgers! This chicken parm burger looks amazing and makes too much sense. I’ll be adding it to my try list! Awesome Femi, I hope you let me know how they come out for you! What a great burger for the summer season! I’m definitely going to make it soon, it looks SO tasty! Thank you, Andrea! Enjoy the chicken parm burger! Cindy, feel free to use the same recipe on a boneless chicken breast! The flavors are also awesome. Let me know when you make it, send me a pic and enjoy! There is this cute little bistro close to my house in New Orleans that serves the best chicken parmesan sandwich! These flavors sound refreshing for summer and I bet this will be a hit for summer cookouts, potlucks and holiday parties! Absolutely, Jessica, these are a favorite and perfect for BBQs. Love the hack of making ground chicken. It is so expensive in the store. Looks delicious! I agree, store purchased ground chicken is super expensive and making your own is super easy. These look delicious! My family loves chicken parm, and this is a perfect way to enjoy it over the summer. I especially like your idea of freezing some for later. sounds positively drool worthy! love chicken parm but it’s always so greasy and gigantic. this is much more manageable and way healthier without loosing any flavor! You made my day, I hope your husband enjoys the burger, we love it! Oh, I love chicken parm anything, and I also love making a big batch of marinara to have on hand as a component of other meals, so this is an exciting addition to our menu line-up! And absolutely perfect for summer grilling! Monica, you made my day! I hope you enjoy these chicken parm burgers. My family is also really into chicken parm. Somehow I have never made it at home! I hope you do and your family enjoys! What a great burger to celebrate grilling season! We love chicken burgers and you’ve just taken them to the next level by serving them parm-style. I love that you can freeze them so easily, too. So convenient for summer entertaining! Thank you Amanda! 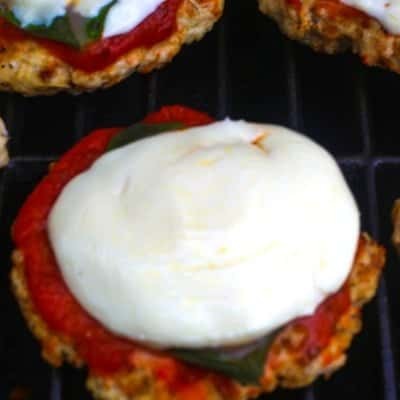 WE do love these chicken parm burgers and being able to freeze is a huge bonus! Wow! What a great recipe!!! Chicken Parm is one of my favorite meals, but I have never turned it into a burger before! Gotta do that! I love all the great notes you gave to help make this really easily! Thank you so much Jenni! These are a favorite for us too! My husband is a huge chicken parm fan and he went crazy for these! Awesome Rebecca! I’m so glad your hubs enjoys these chicken parm burgers! Made my day! This looks like dinner heaven!!! I’m always looking for non-boring chicken recipes! Thank you Jessica. A favorite of my families too!